In a unique initiative to preserve dying indigenous sports, Indian Army’s Red Horns Division organized a ‘Khomlainai’, a traditional Bodo wrestling tournament at Dhekiajuli in Sonitpur district of Assam on Monday and Tuesday last to revive the game as part of Operation Sadhbhavna. The event was organized in collaboration with the Bodoland Indigenous Games Association and various students’ associations of Sonitpur. 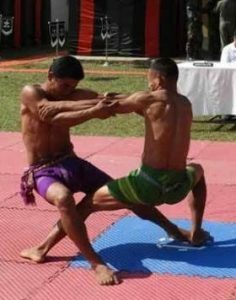 A statement issued to media on Wednesday said, ‘With the passage of time certain regional and indigenous games are disappearing from our society and one of these games is ‘Khomlainai’ (Bodo Wrestling) which is one of the oldest Bodo indigenous game. To revive Khomlainai, as part of Operation Sadhbhavna, unit of the Red Horns Division organized a Khomlainai Tournament at Dhekiajuli Stadium, Sonitpur on November 12 and 13, 2018’. Notably, the Bodoland Indigenous Games Association has been taking keen interest in reviving the Bodo games and sports while organizing various tournaments in the BTAD area. Large number of participants from various parts of the BTAD actively participated in the Khomlainai Tournament. In addition to Khomlainai, other indigenous Bodo games were also demonstrated alongwith a cultural programme showcased by the Bodos, Assamese and Adivasis. The closing ceremony of the Khomlainai Tournament took place at Dhekiajuli Stadium in Sonitpur where GOC, Red Horns Division felicitated the winners and encouraged all the participants for their active participation in the tournament. The Red Horns Division further maintained that promotion of such events is necessary to revive and promote the indigenous games which otherwise shall go into oblivion.